Leonid Padrul resides and works in Israel since 1994. He arrived from the Ukraine as already recognized and mature master of art photography, prize-winner of dozens international exhibitions and photo salons in Russia and abroad. From his early age he took a special interest in landscape photography, one of the most complex genres in this technique. His passion strengthened as he took part in arduous mountaineering tours to Pamir and Tien Shan, never parting with a camera even during the hardest ascensions. In Israel Padrul’s talent blossoms. He runs the photography department of the country’s largest archeological museum in Ramat Aviv, contributes to National Geographic Magazine. Lately Padrul started working as a teacher: he leads master-classes in natural architectural scenery of the ancient cities of Jaffa, Akko, Caesarea, Jerusalem, and in the Judean desert. 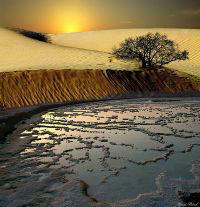 His works are annually displayed at art exhibitions. Israel, a country with ancient Biblical history, opened for Padrul new creativity outlets, made his art deeper and more sophisticated. Especially important for the master’s development became his participation as photographer in archeological projects of studying Qumran caves organized by National Geographic Magazine in 2002. During this expedition, as Padrul admitted later, he got really fascinated by the Dead Sea area, the most interesting but also the most complicated object for art photography. As a result of the ensuing Padrul’s trips to that area, thousands of high quality photos made without computer processing appeared. 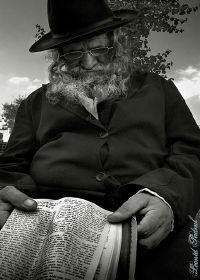 Forty of them were presented at 2007 exhibition “The Shadow of Jerusalem” at Photo Union gallery (Moscow). Jerusalem in the Bible is always associated with light. The Book of the Prophet Isaiah says: "The Gentiles shall come to Thy light, and kings to the brightness of Thy rising." (Isaiah LX, 3.) The mythologem of heavenly Jerusalem is connected with such motives as Messiah’s advent, Solomon’s Temple restoration and clearing of the Golden Gate. Israelis say “to rise to Jerusalem,” which means not only the city’s mountain location but also ascension as a spiritual category. Padrul’s individuality of philosopher and observer was brightly demonstrated in epic-monumental photos of majestic natural landscapes reminding of space photographs. Landscape pictures showing deserted hills once bearing Sodom and Gomorrah, Jericho, remains of Masada fortress, semi-destroyed Herod the Great’s palaces and hardly accessible Qumran caves, all this excites imagination and appeals to historical memory. 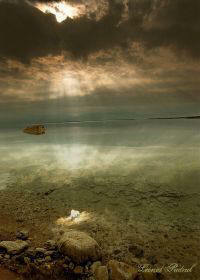 The area of the Dead Sea is in the same time a place which for many centuries attracted Christian pilgrims. Here flows the Jordan River, here stands the Temptation Mountain on which, according to the legend, Jesus prayed for forty days, tempted by Satan. As Padrul himself admits, he was fascinated by the Dead Sea area not only because of its legendary history, but also due to its extraordinary technical and artistic challenges. First of all it featured unusual illumination, completely new to the artist. The blinding sun, sharp contrasts of light create quickly varying effects of complex bright colors and soft dispersed pastel shades. On some photos light and space dominate; on others, the accent is put on primordial essence of the mountains and heavy desert sands or on intricate supernatural patterns of the Dead Sea salt crystals. One can say symbolically that realization of the most complicated project “Landscapes of the Dead Sea” became one more mountain top conquered by Leonid Padrul. Among Israeli artists Leonid Padrul is reputed as an unsurpassed master of extremely complicated landscapes. Photos from the series “Landscapes of the Dead Sea” have been published in all major photo magazines of Israel, Czech Republic and the Ukraine, and in the National Geographic. 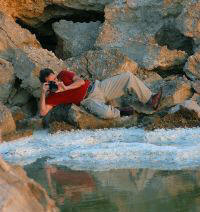 Renowned documentary film director Roni Sofer shot a film about the photographer and his project for TV-channel Nature. 1988 – International exhibition in Brazil (Bronze Medal).